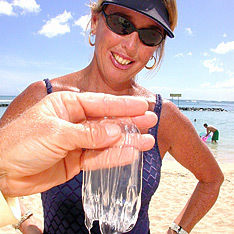 A box jellyfish advisory has been issued for tomorrow and Thursday with possible arrivals today. The affected areas will be Waikiki Beach, Hanauma Bay, Pokai Bay, Makaha Surfing Beach and Waimea Bay. There also have been occasional sightings on the north and west shores of Oahu. For public information about ocean conditions, advisories and warnings, a pre-recorded report can be accessed 24 hours a day at 922-3888, ext. 51. The Honolulu Board of Water Supply received an award for excellence in achieving its environmental goals for 2005 from the state Environmental Council. Other agencies honored included the state Department of Transportation, state Department of Hawaiian Home Lands and Maui Department of Public Works and Environmental Management. » Winners of the 2006 Hung Wo and Elizabeth Lau Ching Foundation Award for Faculty Service to the Community include Patricia Lanoie Blanchette, chairwoman and professor of the Department of Geriatric Medicine at the John A. Burns School of Medicine; Charles H. Fletcher, a professor of geology and geophysics in the School of Ocean & Earth Science & Technology at UH-Manoa; Linda Nishigaya, professor of sociology at UH-West Hawaii; and Ken Staton, associate professor of music at UH-Hilo. » Keoki's Paradise restaurant of Poipu, Kauai, gave its Educator of the Month of May award to Healani Keuma, a health aide, and Mark Gomez, a first-grade teacher at Koloa Elementary School. Each received a $25 gift certificate and Keoki's T-shirt. Police released this surveillance video image yesterday of a man suspected of robbing a bank in Makiki on Thursday. Police are again asking for the public's help in identifying a man who robbed the Makiki branch of First Hawaiian Bank at 9:50 a.m. Thursday. Police released surveillance video images from the Kaiser Medical Clinic where the man was last seen. The man entered the bank and handed the teller a demand note. The man fled onto Pensacola Street and was seen entering the Kaiser Medical Clinic through the Young Street doors. 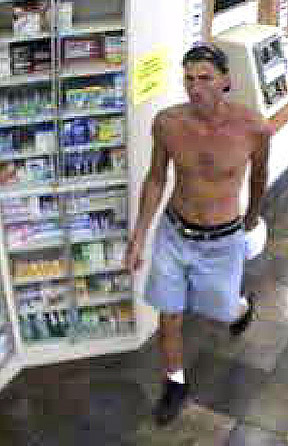 Police said the man took off his shirt in the clinic and was last seen leaving through the South King Street doors. The man is described as 5 feet 8 inches tall, weighing 170 pounds with a thin build. He was wearing a blue baseball cap, blue tank top, blue denim shorts and silver-framed prescription or sunglasses. Anyone with information on the suspect is asked to call CrimeStoppers at 955-8300 or *CRIME on a cell phone. Police arrested a 25-year-old man who allegedly knocked out another man early Sunday at Ala Moana Center. Police said that at about 1:45 a.m. the suspect approached the victim, 29, whom police describe as an acquaintance. As the two were talking, the suspect punched the victim in the face, police said. The victim fell backward and hit his head on the concrete ground and lost consciousness, police said. The suspect tried to run away, but police found him and arrested him for investigation of second-degree assault. A 49-year-old Michigan man died yesterday after a snorkeling trip at Kaupo Bay near Makapuu Point in Waimanalo. The Medical Examiner's Office identified him as Donald Anderson of Royal Oak, Mich.
Police said Anderson was snorkeling with his wife and eight others, who were on a Hawaiian Island Adventures snorkeling tour. While in about 20 feet of water, Anderson's wife noticed her husband drifting toward shore and his face turning blue, police said. Anderson was pulled from the water, and Makapuu lifeguards performed cardiopulmonary resuscitation on him at about 11:10 a.m. He was taken in extremely critical condition to Castle Medical Center, where he was pronounced dead, an Emergency Services Department spokesman said. An autopsy is scheduled for today to determine the exact cause of death. A small fire at an Enchanted Lake house yesterday was caused by a leak in a gas line, police said. The fire at 1189 Akamai St. was confined to the storeroom area at the rear of the house, police said. There were no signs of arson, and no one was injured in the 9:22 a.m. blaze, police said. POIPU, Kauai » The Kauai surfer who drowned while surfing Friday was identified by county officials yesterday as Eric Carvalho, 48, of Wailua. According to police, Carvalho was last seen at about 7:15 p.m., catching a wave at a surf break in front of Poipu's Prince Kuhio Park and the Beach House Restaurant. Shortly afterward, he was found face down, and despite efforts to revive him, he was pronounced dead at Wilcox Hospital. Carvalho is the eighth person to drown on Kauai this year and the second surfer in a year to die in the area fronting the restaurant, home to three surf breaks and a popular snorkeling spot. Last September, Russell Allan Souza, a 47-year-old surfer from Lawai, died surfing during a large south swell at the surf break known as Smoky's. Police were looking last night for a man in his 30s who carjacked an Ewa Beach couple yesterday afternoon at a Waipahu parking lot. The incident occurred at 3:15 p.m. yesterday in the parking lot of the Waipahu Don Quijote store (formerly Daiei) at 94-144 Farrington Highway, police said. Police said the suspect approached the front passenger door of the couple's 2001 Ford Explorer and asked if they knew a woman named Theresa. The suspect then allegedly pulled out a silver semiautomatic handgun and got into the back seat of the sport utility vehicle, police said. The suspect then allegedly took money from the driver, a 58-year-old woman. He then allegedly struck the front-seat passenger, a 53-year-old man, on the right side of the forehead with the handgun, police said. The male victim got out of the SUV, and the suspect then demanded that the woman get out. The suspect then climbed from the back seat into the driver's seat and drove off, police said. The male victim was treated at the scene for minor injuries. The suspect was described as 6 feet tall, weighing 180 pounds with a husky build, fair complexion and a tattoo on his upper left arm that reads "Silva." He was wearing a short-sleeved black T-shirt and blue jeans. Police were still looking last night for the stolen Ford Explorer, whose license plate number is NYR 166. Police are looking for a man who robbed the Hickam Federal Credit Union in Kapolei on Friday evening. Police said that at about 5:50 p.m. the suspect approached the teller, demanded money and fled the scene with an undisclosed amount of money. The suspect is wanted on charges of first-degree robbery. The case is pending investigation. This is the third time the credit union has been robbed in the past three months. The Pearlridge branch was robbed June 29, and the Kapolei branch was robbed April 25.